Hotels or vacation rentals, that is the question, isn’t it? Especially if you travel with a family, and not just by yourself. We usually opt for vacation rentals – whole houses in rural areas, or apartments in the cities. Sometimes they are fantastic, sometimes not so much. 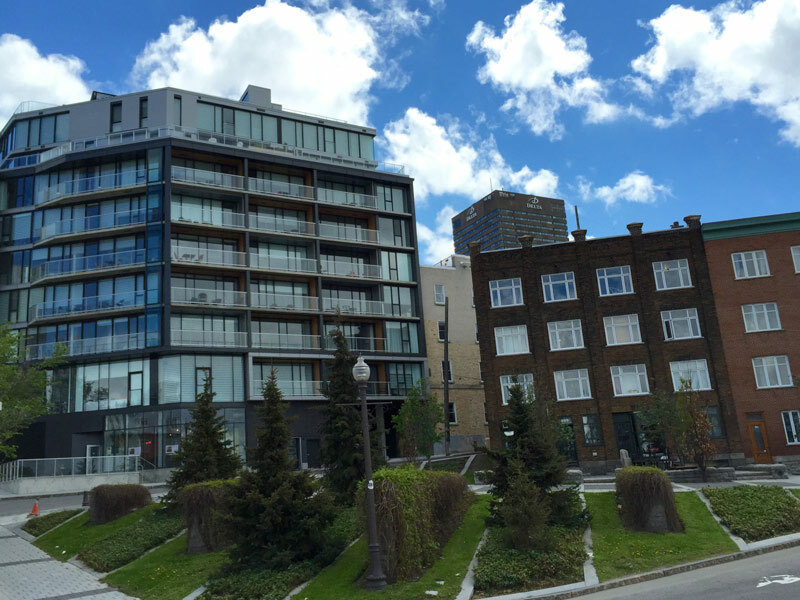 Here’s our review of Le 760 Honoré-Mercier Apartments in Quebec City, Quebec, Canada, where we stayed for four nights last May (2015). 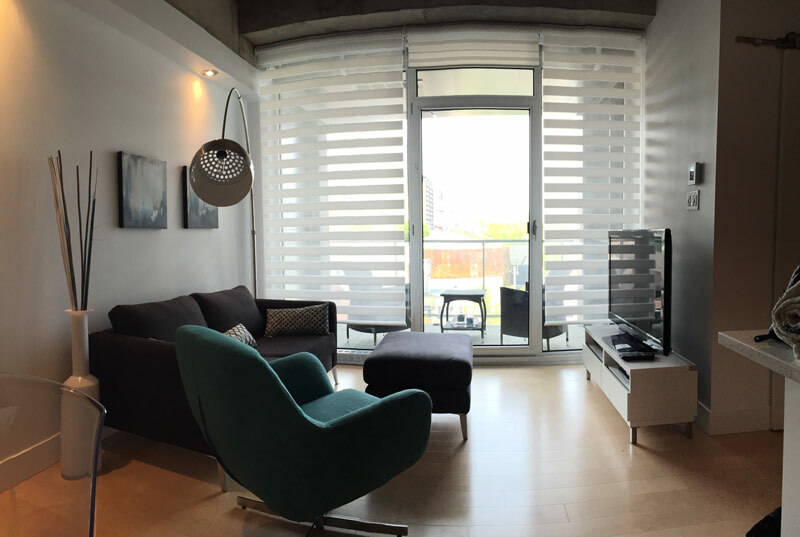 The vacation rentals at Le 760 Honoré Mercier are located in a brand new building just a short walk to Old Quebec area, and a block away from Rue Saint-Jean with grocery stores, restaurants, and plenty other stores. You can rent those straight from their website, but we found booking.com offered a better price. Le 760 Honoré Mercier offers a variety of 1-, 2- and 3-room apartments, and they’re all complete apartments, with a full kitchen, bedroom, and dining- and living-room areas. There is also a garage underneath the building, and when you check in, in addition to a card key to your apartment, you also get a key to enter the building. Only guests of the building can open the front door, even though there is a registration desk and concierge right at the front entrance. When we visited Quebec City last May, we booked Le 760 Honoré-Mercier Avenue 604, which is advertised as a two-bedroom apartment for maximum 6 people. Two bedrooms it does have, but I’m not sure how six people could sleep there comfortably, since the apartment only has two beds, and the sofa in the living room is not a sofa bed. Luckily, our daughter was just small enough to fit on the sofa bed, but a larger child or a grown up definitely would not like it. Le 760 Honoré Mercier Apartment 604 is located on the sixth floor, and consists of two bedrooms, one with a window and one windowless, a bathroom with a shower unit, and a large, open plan kitchen and dinging and living room area. There’s also a small balcony right outside the living room area with a couple of chairs. The living room area is very nicely furnished, with a sofa and a comfortable armchair. In the cabinet underneath the TV there’s a large selection of DVDs, if you still want to be entertained after sightseeing all around Quebec City. The balcony is big enough for two chairs and a small table. The view faces west (the Old Quebec is to the east), but in nice weather it’s a nice place to sit and have a cup of coffee. The dining table is big enough to comfortably sit six people, if need be, and it was plenty big enough for the four of us. There’s an artificial fireplace in the wall by the dining table. The kitchen at Le 760 Honoré Mercier 604 is quite nice, I must admit. It has everything you might need to make your own meals – a full stove with a cooktop and an oven, a dishwasher, a full size fridge with a freezer, and of course plenty of cabinets with plates, dishes, tableware, pots and so on. The dishwasher and the sink are in a peninsula with a counter with a few bar stools on the other side. The bathroom at Le 760 Honoré Mercier 604 has only a shower, but it is a nice, big shower that I wouldn’t mind having in my own house. As you can see in the floor plan, there’s a small closet off of the bathroom, just big enough for large stackable front loading washer and dryer units. One of the bedrooms at Le 760 Honoré Mercier 604 has a window looking out onto the balcony. It’s a rather small room, I have to say, with sliding doors, because regular doors on hinges would not fully open. There is no closet in this room, but there are storage drawers underneath the bed. The other bedroom Le 760 Honoré Mercier 604 has a pretty big closet, but it does not have a window. My son didn’t mind, since we stayed there for just a couple of nights. Both bedrooms have large, queen size beds and are quite comfortable. However, as I mentioned earlier, I don’t know how this apartment could fit six people. Where is 760 Honoré Mercier? 760 Honoré Mercier is within a short walking distance (just a minute or two) to several restaurants, including a funky but good Le Comptoir that you might want to visit if you’d like to try the traditional Quebec dish, poutine. Right across the street from Le Comptoir is the closest grocery store, French-owned L’intermarché. It’s not huge, but it has everything you might need for a couple days stay in Quebec City. How much does staying at Le 760 Honoré Mercier 604 cost? We usually do opt for vacation rentals because even though they are a bit more expensive than hotels, we usually save some money by not going out and instead cooking our own meals. Le 760 Honoré Mercier apartments are not exactly cheap. When we booked it through Booking. com, we paid CAD 1,046.79 ($871.599 US) when we stayed there for four nights in May 2015. That came down to $217.90 US a night. However, check the price for this apartment for the dates you want to go, because it does change. You could get it for much cheaper than we did, depending on when you travel. All in all, while you can get a room with two double beds at the Hotel Palace Royal right across the street for CAN $159.99 ($133.21 US), we think $217 a night is not too outrageous for a two-bedroom apartment. If you calculate how much it might cost for a family of four to go out for breakfast, lunch, and dinner I’m sure you realize that could turn out to be quite be pricey as well, depending on where you eat. Did We Like 760 Honore Mercier? The apartments at Le 760 Honoré Mercier are certainly very nicely decorated, and the kitchens and bathrooms are brand new and well equipped, so I really liked that part. I also liked the underground parking and the security features. You can read our and other visitors’ reviews of Le 760 Apartment 604 on the booking.com website to decide if that’s where you’d like to stay. If it were me, I’d put a bunk bed or two single beds in one of the bedrooms, because the current configuration allows pretty much just two couples. Alternatively, if the sofa in the living room was a sofa bed, even though it’s an open area, for a few nights it would have been all right to sleep there. All in all, even though I did like the decor, I’m not sure we’d consider that particular apartment again next time we’re in Quebec City. I might check, however, if any of Le 760 Honoré Mercier other apartments would suit our family better (if any of the apartments have a sofa bed). If you’re planning to travel to Quebec City in a large group, take a look at Le 760 Honoré Mercier offer and see if they have anything you might like. The company certainly seems to be well managed, and as I said, the building seems to be quite new and the apartments are very nicely furnished. Wherever you decide to stay in Quebec City, I hope our other posts about this beautiful city will come in handy. Feel free to also take a look at our Quebec City Pinterest board. Also, don’t forget to join the #WeekendWanderlust chat on Twitter we hold every Saturday. Usually the chats are at 11am EST, 3pm GMT, 11 pm SGT, but this weekend on October 31, because out topic is Australia, we are holding the chat at a special time – 9pm EST so that chatters from Australia can join. I hope you can join as well to ask our guest hosts your questions about that fascinating continent. You can see the list of our other upcoming topics on Travelogx. Very detailed review. All the information you need in one place, quick and accessible. Great Review! Thank you for reading, Justin! Glad you like the review. Thank you for reading, Christine! I don’t know if I’d want to live in that particular apartment, but it was definitely spacious & well equipped. Thanks for the thorough review. We rent condos/apartments frequently so we can cook our own meals and it is nice to have this information if we ever visit Quebec. Thank you for reading, Allison! As I said, this place is worth considering if you travel in a group. There are plenty hotels in Quebec City, but not a whole lot of rentals. Thanks for the very thorough review. We have rented apartments from time to time, though as it is just the two of us, we probably have more latitude when it comes to choice. I have the strongest yen to visit Quebéc City, but think that staying right in the heart of the Old City would suit us better. Thank you for reading, Arnie. This place is just a short walk from the Old City, and Rue Saint-Jean is worth a stroll as well, so we enjoyed that location, but of course everyone has slightly different preferences! Thank you for reading, Sara! The thing about rentals is that the larger your group, the cheaper it comes to overall. If you are traveling with other people, it’s worth looking into, actually. Wow this is really nice. I would love to stay there. Thank you for sharing. WOW so modern! I love all the little details! I could definitely see myself staying here! QC is on my wish list – hopefully I make it there in 2016! I think if you are traveling with a family, or in need of more than one hotel room then looking for a suitable house or apartment rental is a good option. You seemed to have found a well furnished unit and as you point out the money you save on food could be worth it alone for some groups. Looks very swish! I think the price is reasonable. That was a great kitchen and dining set up and when you travel, it’s nice to have some meals in. Wow looks like a very luxurious place! I would love to stay there! Last time Andrew and I were in Quebec City, our daughter wasn’t born yet. We stayed at the Frontenac, which was fantastic but I’m sure the prices have really gone up by now. We definitely want to take Bailey to Quebec City sometime soon and would surely consider an apartment like the 760 Honere Mercier Apartments. Thanks for the great review. Brenda recently posted…Tween Traveler Writes About Missing The Food in Italy!